Ending months of anticipation, Fox has confirmed a mid-November landing for 'Firefly,' which will come to Blu-ray as a three-disc set with multiple exclusive features. After weeks of rumored street dates, Fox today issued the official press release for the complete 'Firefly,' which will hit Blu-ray on November 11 as a three-disc set containing the short-lived series' complete fifteen-episode arc. Tech specs see three BD-50 dual-layer discs, presented in 1080p/AVC MPEG-4 and DTS-HD Lossless Master Audio 5.1 Surround. Audio options include French and Spanish Dolby Digital 5.1 Surround dubs, an additional German DTS 5.1 Surround track, and English, Spanish and Dutch subtitles. Extras include audio commentaries with cast & crew on eight episodes, four featurettes ("Here's How It Was: The Making of "Firefly,'" "Serenity: The 10th Character," " Joss Sings the “Firefly” Theme," "Joss Tours the Set"), deleted scenes, a gag reel and audition tapes. Exclusive to the Blu-ray is an additional audio commentary by executive producer Joss Whedon and actors Nathan Fillion, Alan Tudyk and Ron Glass (on "Our Mrs. Reynolds"), and the featurette "'Firefly' Reunion: Lunch with Joss, Nathan, Alan and Ron." Suggested retail price for the Blu-ray has been set at $88.98. 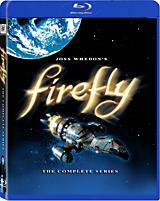 You'll find complete specs for 'Firefly' linked from our Blu-ray Release Schedule, where it's indexed under November 11.